THE remote Mendo primary school, situated on the slopes of the mighty Yalo river in Kagua-Erave district of the Southern Highlands province would be K1 million rich sooner. This follows the announcement by local MP James Lagea and his district development authority (DDA) team who visited the school last Thursday. Mr Lagea and team had to bear the chilly weather condition including the heavy downfall that afternoon to be present his people of Mendo 1 and 2 council wards that numbers well over 3000 eligible voters. Mr Lagea also delivered a K300 000 in cash to the people in the same ceremony to pay them for the labor intensified road project that the locals have been involved. 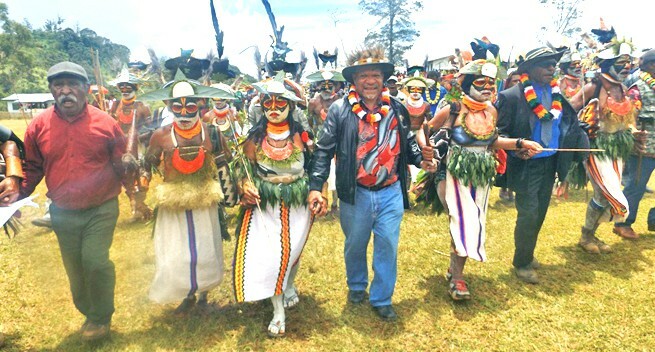 A traditional singsing group, students with creative dances and well- over 5000 plus people gathered at Mendo to receive the MP and his delegation. Mendo is situated on the border that divides the neighboring Ialibu-Pangia district and the occasion also saw Kewabi speaking people from Ialibu coming to witness the occurrences. In announcing the K1million to the school, Mr Lagea said as soon as the funds hit the district coffers this year, Mendo will get the K1 million to start improvement work on the school’s infrastructure and assured the locals that the contractor would come from the locality. Mr Lagea said the K1 million is from the K5 district services improvement program (DSIP) funds allocated under the health and education sector in 2015 by the National Government of which K1. 5 million was allocated to the Imbia primary school and health centers recently. Mr Lagea said as soon as the money is available, he would invite either Southern Highlands Governor William Powi or Hela Governor Francis Potape to come and make the presentation.